Wow! What a crazy couple of months. Let's start by saying that Jetlag is VERY REAL ha! Finished off the One World tour in late October to possibly the most enthusiastic crowd we had experienced all tour, in Orlando! Spent a couple days visiting with family after the tour, which was an absolute breath of fresh air after being on the road for 8 weeks. Came back to NYC to perform with the Pedrito Martinez Group-- I have come to the conclusion that this is the absolute hardest band to substitute in, definitely have some homework to do-- thank you Jhair, Pedrito, Alvaro, and Edgar for constantly evolving, and giving me a chance to try and catch up. I had the pleasure of working on the inimitable steel pannist Victor Provost's newest album. With a stellar cast of musicians including Alex Brown, Zach Brown, Billy Williams and special guest Etienne Charles, needless to say this s*** is cooking!!! Really looking forward to hearing the final product. The I had probably one of hardest travel lags in recent memory-- traveling from NYC to Buenos Aires, back to NYC and then to Hong Kong and back in a matter of 10 days. Might not sound so bad for some of you constant world travelers, but certainly wore me down a bit. Had a great time rehearsing and playing three sold out shows at the Hong Kong performing Center with Cantonese pop singer Bianca Wu, and a great group of musicians from NY. Now I'm here in suburbs of Boston, MA ready to spend the Holidays with my loved ones in some strangely mild winter weather. Happy Holidays! ONE WORLD TOUR | In THE THICK OF IT! Hey Folks! A little more than half way through this North American leg of Ricky Martin's One World Tour. We've been at it for a little under five weeks and have played to some amazing crowds in Oakland, Los Angeles, Las Vegas, San Antonio and a host of other amazing cities. We are just a couple days away from performing at New York's Madison Square Garden. I have had the pleasure of seeing a few artists here as well as a host of sporting events, but it will be my first time on stage! Definitely looking forward to the energy and diversity of the NYC community. And of course some die hard fans! We just finished up a run of 8 shows in 10 days so these three days off in New York come at the perfect time. The bus life can be tedious at times, but getting into a routine really helps, as well as being with fun group of guys that keep things interesting at every turn (to say the least, ha!). We'll be on the road through the end of October with shows still to come in Chicago, Toronto, Montreal, Atlanta, Miami, Orlando, and handful of other cities. Hope to see some familiar faces along the way!!! Extremely excited to share this video from my most recent trip to Latin Percussion with my brother Eric Doob! For those of you wondering, the metal plate is an amazing instrument called the "Hadphoon," created by Jamey Haddad! Of course this is only one of it's many applications. Huge thanks to Tom Schwarz and David Beverly for their patience and hard work polishing the final cut! May brought a bunch of great projects my way including the release of the Matthew Stevens Group "Woodwork," which I am very proud to have been a part of, it's a learning experience for me to share the stage with musicians of this caliber. I also had the opportunity to lay down some tracks on Jeremy Bosch's upcoming record-- an amazing singer/flautist/composer from Puerto Rico who is currently living in NYC. from In other news, we just finished up our last day of rehearsals here in Monterrey, Mexico and are geared up to hit the road on this leg of Ricky Martin's One World Tour!!! More photos coming soon! Greetings from Sydney, Australia!! We are are approaching our final days on this leg of Ricky Martin’s One World Tour. We've had an amazing time touring New Zealand top to bottom, as well as all over Australia over the past the past several weeks. Even found some downtime to visit Magnetic Island off the coast of Townsville, as well as catch some wonderful views of the city in Auckland, NZ. Last night we performed at the Logie’s Award Show where I had the pleasure of running in to some wonderfully talented Berklee friends currently on tour with Meghan Trainor! We’ll finish up the tour in Perth, after experiencing one of the best Australian crowds while here in Melbourne and head back to NYC for a few events! Be sure to look out for the Matthew Stevens Group CD Release Tour with dates in NYC, L.A., Durham, and Washington D.C. later this month. And last but certainly not least, I had the pleasure of visiting LP Studios with my brother Eric Doob to shoot a video clip for the website that will be out later this month! Back in L.A. and New York we were doing some promo dates for Ricky's new album, A Quien Quiera Escuchar. I must admit this may be my favorite album of his to date (he would probably agree!). It's by far the must raw, honest, and intimate record he has put out, sonically as well as thematically. It's got a little something for everyone, and was blast to rehearse and put together. If you haven't already, take a minute to check out Ricky at his best! It's back to the shed for now, in April we start 2015's One World Tour--kicking off in New Zealand & Australia, and wrapping all the way around the globe to the U.S. in the fall. Hope to see some friendly faces along the way! What an amazing year! Ecstatic to be back home spending the holidays with my family here in Massachusetts. This year was full of surprises, new friends, immense challenges, and of course some of the most unbelievable musical endeavors I have ever been a part of. From being the "new guy" on tour and on stage with a whos' who of legendary performers at Carnegie, to enjoying every moment of playing with my closest friends through out the year, 2014 was one for the books! Feel free to read up on my other entries just below. Yes, that Ricky Martin! 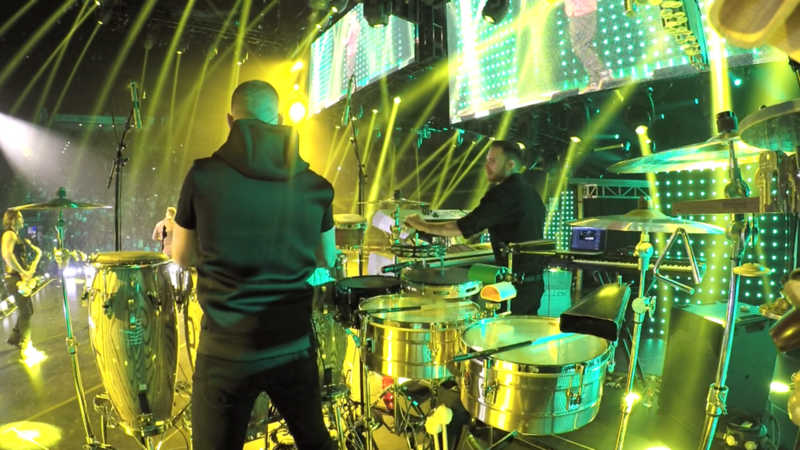 It's official-- just wrapped up two weeks of rehearsals here in Mexico City to head out on tour with Ricky Martin! Overjoyed and very thankful to Tony Escapa, David Cabrera, Ricky, and the whole RM camp for giving me this opportunity. We will be on tour in Mexico, with a short stint in South America, October through the end of the year. I got a preliminary call from Ricky's MD David Cabrera (via Tony's recommendation) for a potential audition-- hustled to learn and send them an HD video recording of a couple of the percussion heavy medleys, and was lucky enough to make the cut! Feel free to check out the Official Ricky Martin Website for a full list of dates. I'll do my best to post as many pictures from all the upcoming adventures and shenanigans. HERE WE GOOOOOO!!! July and August have been incredible. I spent an amazing week teaching and performing alongside members of the Paquito D'Rivera Quintet for his inaugural Berklee Latin Jazz Camp, capped off by a performance at the Regatta Bar. We had some outstanding students, as well as a slew of very informative clinics/seminars given by Berklee faculty-- and of course some hilarious anecdotes from Paq-man himself! Later in July I was fortunate enough to have my band headline the Tito Puente Summer Music Series in Boston as well as a music series at the Brooklyn Public Library. August also flew by with some great concerts alongside Ralph Peterson, Marie Davy, Gerardo Contino, Itai Kriss and Telavana, and Gian Carla Tisera. Getting ready for the fall and excited to share great news very soon!!! Had a wonderful time performing with Paquito D'Rivera's sextet at the Arsht Center in Miami. We had the pleasure of accompanying New York's amazing Ballet Hispanico for two incomparable evenings. Later in the month I was part of Godwin Louis' Jazz Gallery commission debut. An intense Afro-centric landscape he created in homage to his native Haiti, with the influence of the sounds and textures of its surrounding Carribean islands. Finally, I was excited to form part once again of the Rodriguez Brothers Quintet at the Jazz At Lincoln Center's "Swing!" event, which saw Jonathan Batiste, Elio Villafranca, and one of my favorite vocalists of this generation, Cecile McLorin Salvant receive awards of exellence. Headed off to Boston for Paquito's inaugural Latin Jazz Camp-- a week long intensive alongside Paquito's sextet, organized by Oscar Stagnaro! Last month I was fortunate enough to get the call to fill in the percussion chair for Sting's biennial Rainforest Fundraiser. I had blast playing some of my all-time favorite songs, with a superstar cast performers. James Taylor, Paul Simon, Dionne Warwick, Chris Botti, Oscar Issac, Kevin Spacey, Stephen Stills, Lisa Fisher, and Sting did an incredible job fronting the orchestra. Among the members in the immeasurably talented band was musical director Michael Narada Walden, bassist Will Lee, Pianist Leon Pendarvis, "Bones" Malone, Jim Hynes, with Frank Martin, Katreese Barnes on keys! As if it weren't enough, the concert happened to land on my birthday-- an unforgettable experience turning 27 under such extraordinary circumstances! Post concert photo-op with Sting and Katreese Barnes! What an amazing three weeks on the road with Angelique! We performed all over the East coast and Midwest. I was lucky enough to share the experience with her wonderful band, Dominic James, Ben Zwerin, tour manager Patrick Murphy, driver extraordinaire Les Ingram, and my musical brother Daniel Freedman. While on the road in Atlanta, I was visited by Michael and Kevin Vosbein of Crescent Cymbals to pick out some new sounds! I went with a few Jamey Haddad's new line of Haptic cymbals as well as beautiful a ride from the Hammertone series. Angelique is an incomparable performer. Her singing is rivaled only by her powerful dancing and prowess as an MC, what a lesson it was day in and day out to witness her take the stage. Looking forward to the next one! What a whirlwind month January was. Kicked off by a performance at in negative temperatures with Jen Carlos Canela, followed by an inspiring series of Monday night performances at NuBlu with Jason Linder, and a flurry of performances with PSG throughout the month! 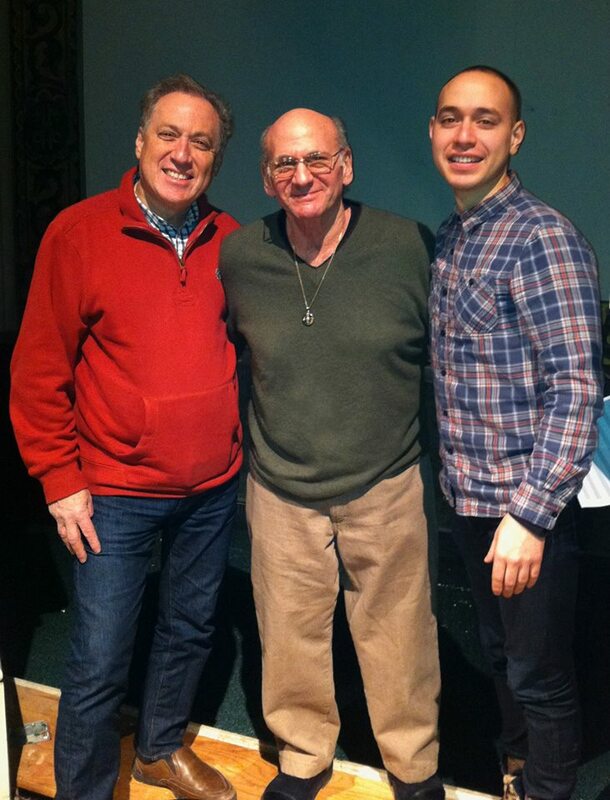 I was also ecstatic to contribute to jazz great Dave Liebman's new record. It was a set of pieces for Saxopone, Bass, Drumset, and three percussionists. Always pleasure to play alongside my father Oscar Stagnaro, and some of my habitual partner's in crime Marcos Lopez, Gabo Lugo, and Willy Rodriguez. The album was recorded through a binaural microphone named LARS (ha!) 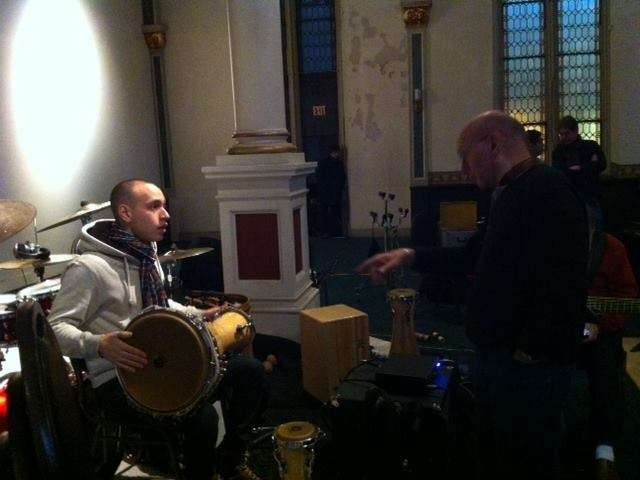 at an amazing church in Greenpoint, Brooklyn for Chesky Records. There are very few people who play with the intensity that Dave does, it is a joy to behold. Really looking forward to hearing the finished product later in the year, keep an ear out! !